The stock price of Qingdao Port International Co, operator of the world's seventh busiest port by shipping volume, has maintained the rally for three days after it made its debut in A-share market on Monday. The stock price reached the upper trading limit at 8.03 yuan ($1.18) on Wednesday morning, compared with the issue price, as the price has surged by 44.03 percent after it was officially listed on the Shanghai Stock Exchange on Monday. 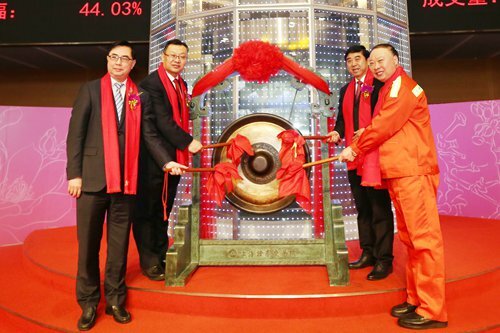 It is the first Hong Kong-listed firm to launch its initial public offering (IPO) in the A-share market this year. The financing raised via the IPO is around 2 billion yuan, which will be used to improve the port's infrastructure and enhance delivery capacity, according to its prospectus. The listing has opened overseas capital channels as it is now listed on both A-share and H-share markets, Li Fengli, chairman of the board of the Qingdao Port Group, told the Global Times on Tuesday. He said the port is expected to open more international routes, making the port into an important hub in northern and northeast Asia. Qingdao port, with a history of more than 100 years, mainly deals with terminal handling and supporting services for containers, metal ore, coal, bulk liquids, grains and other goods. It now connects with over 700 ports in 180 countries and regions around the world. The port's net profit increased by 21.67 percent year-on-year in 2015, 16.17 percent in 2016 and 40.94 percent in 2017, according to its prospectus. And the company realized a net profit of 2.85 billion in the first three quarters of 2018, up 16.89 percent over the same period last year. The company was listed on the Hong Kong Stock Exchange in June, 2014.